Pancreatic fistula is the main post-operative complication of distal pancreatectomy associated with other further complications, such as intra-abdominal abscesses, wound infection, sepsis, electrolyte imbalance, malabsorption and hemorrhage. 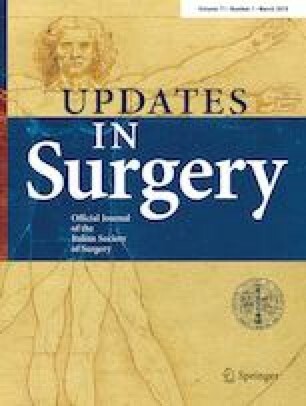 Surgeons have tried various techniques to close the stump of the remaining pancreas, but the controversy regarding the impact of stapler closure and suture closure of the pancreatic stump is far from resolved. In this study, we reported our technique and results of robotic assisted distal pancreatectomy with ultrasound identification and consequent selective closure of pancreatic duct. Twenty-one patients underwent consecutive robotic-assisted distal pancreatectomy were included in our study. We describe our technique and analyzed the operative and peri-operative data including mean operative time, intra-operative bleeding, blood transfusions necessity, conversion rate, mortality and morbidity rate, pancreatic fistula rate and grade, time of refeeding and canalization, length of hospital stay and readmission. Median operative time was 260 min. No conversion occurred. Estimated blood loss was 100 mL (range 50–200). No blood transfusions were performed. Mortality rate was 0%. One (5%) patient had a major complication, while 9 (43%) patients had minor complications (grade I). Three (14%) patients developed pancreatic fistula (grade B), while two (10%) patients had a biochemical leak. No late pancreatic fistula and re-operation occurred. The refeeding was started at second day (range 1^–6^) and the median canalization time was 4 days (range 2–7). The median hospital stay was 6 days (range 3–25) with a readmission rate of 0%. Robotic distal pancreatectomy can be considered safe and feasible. Our technique is easily reproducible, with good surgical results. The online version of this article ( https://doi.org/10.1007/s13304-018-0605-6) contains supplementary material, which is available to authorized users. Study conception and design: BP, LM. Acquisition of data: BP, LM, LB. Analysis and interpretation of data: BP, LM, LB, MF, MA and AC. Drafting of manuscript: LM, BP, MA, LB. Critical revision of manuscript: BP, LM, LB, MF, MA and AC. All procedures followed were in accordance with the ethical standards of the responsible committee on human experimentation and with the Helsinki Declaration of 1964 and later versions. Informed consent was obtained from all patients.